I'm torn: I love all the old classics, but I'm also feeling a little stir-crazy. My solution? I'm spending the month of December playing around with new cookie recipes. The new Perfect Cookies, for all your occasions. So here is Part 1: The Perfect Cookie for Dinner at A Friend's House. A delicious little cookie that will fit in comfortably on a cookie plate, but can also dressed up into a dinner party dessert with the addition of some lime curd and a scoop of ice cream. In a small bowl, use your fingertips to rub the lime zest into the sugar. Cream together the butter and lime-zest-infused sugar until well-blended and light in colour -- about 3 minutes. 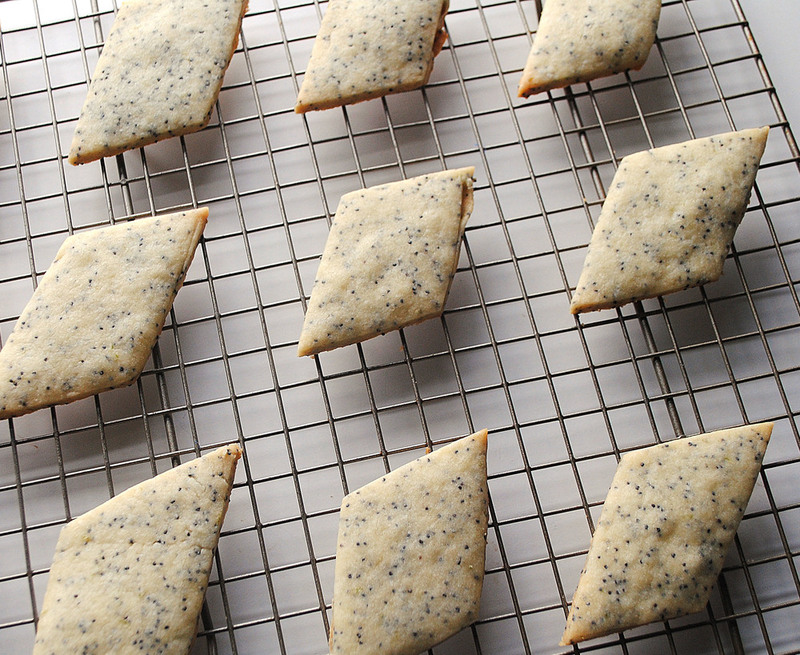 Meanwhile, whisk together the flour, cornstarch, salt and poppy seeds. Add to butter mixture and slowly mix until it forms a crumbly ball of dough. Turn out onto a piece of plastic wrap, and flatten into a rough rectangle. Refrigerate for 20 minutes. Once cool, roll the dough to a thickness of 1/4" and cut into diamonds (or, in my case, uneven trapezoid-type rhombuses). Bake for 20-22 minutes until the edges begin to slightly brown. Transfer to a cooling rack and cool completely. Nibble repeatedly, while sugar plum fairies dance in your head.